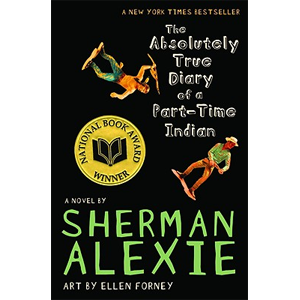 This month, the Richland School Board voted 3 to 2 to exclude Sherman Alexie’s award-winning book The Absolutely True Diary of a Part-Time Indian from Richland high school classrooms. Alexie’s semiautobiographical novel won the National Book Award for young adults in 2007. It tells the story of Arnold “Junior” Spirit, a teenager growing up on the Spokane Indian Reservation in Washington, where Alexie also grew up. Junior struggles as an awkward but bright 14-year-old who loves drawing comics. The book tackles many tough issues, including racism, alcoholism, poverty, death, as well as more typical teenage struggles like fitting in. The book was piloted for Richland’s ninth-grade language arts curriculum because of its realistic portrayal of the high school experience and compelling theme of perseverance. The piloting teacher acknowledged that the book contains some profanity and sexual references. Parents were notified and given the choice to opt-out their student from reading the novel. Students and one parent read and reviewed the book. Ninety-five percent of them recommended the book – some with reservations – to be added to the curriculum permanently. Students wrote that the book was fun to read, humorous, and motivational. Some noted the profanity and sexual references, but liked that the language was realistic for a teen boy. They also appreciated that the book dealt with sensitive issues for teens. Despite these positive reviews, the school board voted to exclude the book from all classrooms in the Richland School District, not just from the ninth-grade curriculum. School board members admitted they did not read the book before voting. The board said because of a split opinion on the book from the Instructional Materials Committee, whose members read the book, that it was best to prohibit its use entirely. Other school districts have taken similar actions, landing Sherman Alexie on the American Library Association’s list of most frequently challenged authors for 2010. Alexie recently discussed his novel and his views on young adult literature in a pointed Wall Street Journal essay. School boards have broad discretion to determine their district’s curriculum. However, banning books is always troubling, especially when those voting to ban the book have not read it. Realistic young adult literature is one way for teens to know others are dealing with the same issues. This is especially true in an area of Washington where many teens face the same problems in their communities as Junior in Alexie’s novel. The novel’s message of perseverance can also be a source of inspiration for high schoolers not sure whether to pursue their academic interests. Banning Alexie’s book does not protect Richland students. Rather, it deprives them of a source of inspiration, humor, and encouragement to pursue their interests. Sherman Alexie will be speaking at KUOW-FM’s “Weekday” Live at Town Hall on Friday, July 1, from 9:00 to 11:00 a.m. Tickets are sold out, but the show will be broadcast live on KUOW.